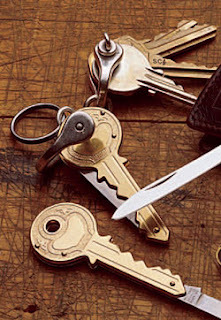 The key knife as it name indicates is a small keychain knife in the shape of a reguler key. The blade of the knife opens from the key and when stored it is hold by friction. The key size is just a little longer than the regular keys we have here, it can certainly camouflage in a keyring as another key but with just a little inspection you can notice it is not a regular key because the blade can be seen. In other words the blade does not hide completely behind the key. Opening and using this little knife is easy, it works fine to open boxes, cut paper, envelopes and other minor cutting jobs that are common for a keychain knife. The grip if you need to cut something a little more resistant is not very good because the key as a handle makes the blade a little fragile and it has some noticeable play in the joint with the key so we wouldn't recommend serious cutting jobs with this little knife. It is certainly a very interesting tool to have in your keychain in case of need, the only problem is that you may forget you have it. You can get it for about $24 from Garrettt Wade.